Almost all the political parties have been caught off guard by the announcement of the Election Commission to hold polling for the state Assembly on January 30, 2012. None of the political parties have finalised their candidates as yet as they expected the elections in the month of February. However, the announcement by the Election Commission has sent them in a tizzy. With the Assembly poll bugle having been sounded in the state, president of the state Bharatiya Janta Yuva Morcha (BJYM) Vinod Kandari flagged off the Hoonkar Rath Yatra from Thatyur town in the Dhanolty Assembly segment in Tehri Garhwal district today. 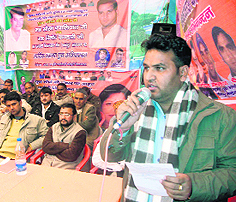 State BJYM president Vinod Kandari addresses a gathering during the Hoonkar Rath Yatra organised at Thatyur in Tehri Garhwal district on Saturday. Nainital, December 24 The Left parties would be contesting 15 seats in the coming Assembly poll scheduled to be held on January 30. Out of these five seats would be contested by the Communist Party of India (Marxist-Leninist)/CPI (ML) for which it has announced its candidates. The Chief Minister, Major-Gen Bhuwan Chandra Khanduri (retd), has said the country needs a strong, an independent and impartial Lokpal. For this the Lokpal’s financial and administrative independence must be ensured. He was speaking as chief guest at a one-day national seminar on “Corruption and the Lokayukta Act of Uttarakhand” which was organised by Uttarakhand Open University (UOU) at SGRR Medical College here today. Writers, thinkers and intellectuals from across the state gathered in Nainital on Saturday to chalk out a road map for taking forward the legacy and thought of revolutionary folk poet and cultural activist Girish Tewari who is fondly remembered as Girda. The day-long deliberations were organised by the well-known cultural organisation, Pahaad, in collaboration with the Uttarakhand Bhasha Sansthan. The Uttarakhand Parivartan Party (UPP) will be launching the second phase of its Hoshiyar-Khabardar Yatra from Sunday. The Team Anna will campaign against the Congress in the coming state Assembly elections. Addressing a press conference here, Anna’s core team member Manish Sisodiya said as the Centre had failed to come up with an effective Lokpal Bill, it would be opposed by the Team Anna in five poll-bound states of the country. With the Assembly poll fast approaching rivalry between the Congress and the ruling BJP in the town has intensified. The incident at the inauguration of the science faculty building in an intermediate college by minister Prakash Pant on Wednesday where he was opposed by villagers has led to workers of both the parties burning effigies blaming each other for the incident. A total of 38 new polling booths have been added to the list of the existing booths in all four constituencies of Pithoragarh, taking the total number to 502. One of the oldest hockey tournaments of India, the All-India Swami Shraddhanand Hockey Tournament commenced here today at Gurukul Kangri Univeristy. In the first league match Northern Railways beat Shah Jahanpur 6-4. Members of the Purvanchal Jan Sangharsh Morcha (PJSM) distributed letters addressed to Rahul Gandhi and other Congress leaders of the state in the Congress rally held here yesterday where they demanded a direct rail service for people of the Purvanchal belt. BC Khanduri has raised objections to the announcement of poll date of January 30, 2012, for the Assembly elections in the state. Khanduri, who is in Delhi, said due to cold weather conditions, the polling percentage would be low. Meanwhile, Ajayendra Ajay, a spokesperson for the state BJP, demanded that the EC should reconsider its decision of holding the elections in January. The ruling BJP has not yet even finalised the panel of names of party candidates for each Assembly segment. The party was following a wait-and-watch policy and wanted to announce its candidates after the rival Congress finalised its candidates. On the other hand, the Congress leaders were also expecting that the final list of the candidates would be announced by the Central Parliamentary Board in the second week of January. However, the party is better placed with the finalisation of the panel of names of the candidates. The list of panel of names for each constituency has been cleared by the state election committee and would be vetted by the central screening committee of the Congress headed by Union Minister Anand Sharma. According to Congress sources, the screening committee would be meeting on December 25 to give its recommendations to the Central Parliamentary Board. In the changed circumstances, both the ruling BJP and the rival Congress have to work overtime to finalise its party candidates for the 70 Assembly segments as only 36 days are left for the elections. “We will try to announce the party candidates soon,” said Yashpal Arya, Uttarakhand Congress chief. The picture is not clear even in the third front. There has been an intense infighting among various constituent parties on the sharing of seats. Interestingly, most of the Congress probables have dashed to Delhi after the announcement of the poll dates by the Election Commission. The yatra will be organised in all the Assembly segments of the state with the objective of recounting the achievements of the BJP-led government. Another motive behind launching the yatra is to unmask the true face of the Congress-led UPA government which has allegedly hindered the development projects initiated by the BJP government in the state. Addressing a large gathering, Kandhari said the state had made tremendous progress under BC Khanduri’s leadership and his resolve to provide a corruption-free government in the state had been strengthened with the enactment of an effective Lokayukta Act. Kandari also said the new policy for the youth propounded by Khanduri would also help in curbing migration and unemployment in the state. Kandari, responding to the charges of corruption levied by Congress general secretary Rahul Gandhi during his recent visit to Dehradun, said: “Rahul was misleading the common man of the state with his comments that were nothing but a façade to hide the wrongdoings of the Congress ministers at the Centre”. District president of the BJYM Virendar Rana, senior BJP leaders Narayan Singh Rana (father of ace shooter Jaspal Rana), Subash Ramola, Rajesh Nautiyal and others were present. The Left parties would be contesting 15 seats in the coming Assembly poll scheduled to be held on January 30. Out of these five seats would be contested by the Communist Party of India (Marxist-Leninist)/CPI (ML) for which it has announced its candidates. Those contesting on the CPI (ML) tickets would be Indresh Maikhuri from Karanprayag, Purushottam Sharma from Salt, Jagat Martoliya from Dharchula, Man Singh Pal from Lal Kuan and KK Bora from Rudrapur. The remaining 10 seats from which the Communist Party of India (CPI) and the Communist Party of India (Marxist) would be fielding their candidates would be Badrinath, Kedarnath, Tharali, Tehri, Gangotri, Nanakmatta, Kashipur, Sahaspur, Raipur and Ranipur. The state in charge of the CPI (ML) Raja Bahuguna has stated that the Left parties are committed to providing a strong opposition to the BJP and the Congress who have allegedly given patronage to mafia culture in the past 11 years and the voice of the people has never been been heard in the state Assembly. He said the Left has always been open towards having a joint regional front but such a possibility has not taken a concrete shape because of the opportunistic outlook of forces like the UKD (Panwar) and the Uttarakhand Raksha Morcha. “It is while keeping in mind the requirement of a regional front that the Left has decided to contest only 15 of the identified 39 seats,” said Bahuguna. He has further stated that the Left would support those candidates on the remaining seats who are not in favour of having any alliance with either the Congress or the BJP before or after the poll. Khanduri said 2011 would be remembered as the year of awakening in the history of the country. A large section of the youth has come forward by drawing inspiration from Anna Hazare’s battle against corruption. The people have now started believing that war against corruption can not only be fought but also that the scourge can be removed. Explaining the background of the Uttarakhand’s Lokayukta Act, the Chief Minister said it was through values imbibed during his training in the Army that he drew inspiration to act against corrupt means. He received abundant support and encouragement by the praises showered on the works done by him as Minister for Road Transport and Highways in the Atal Behari Vajpayee government. In 2007, when he first became the Chief Minister, the provision regarding interviews on a number of posts was scrapped to bring about transparency in the recruitment process in the state. In addition, the candidates were allowed to take back a carbon copy of the answer sheets along with them to tally the same with the results. In 2011, when he again became the Chief Minister, there was inspiration for him in the form of Anna Hazare’s movement which propelled him to take concrete measures against the scourge of corruption, he said. It was a result of the feeling that barely within two hours after the swearing-in ceremony, the state Cabinet at its first meeting adopted a decision to bring in a strong Lokayukta Act and the Right to Service Act. The Lokayukta Act of Uttarakhand has drawn praise from people throughout the country and it has been desired that the Centre as well as the other states adopt this Act as a model. Khanduri said in the Lokayukta Act of Uttarakhand, in order to prevent the Lokayukta from turning into a dictator, has been given the shape and form of an institution rather than that of an individual. The Lokayukta has been given administrative and financial autonomy. Provisions have been made for careful scrutiny in the selection of the Lokayukta. The Chief Minister said that many a time steps that were initiated with fullest commitment and sincerity could prove to be incorrect later on. Therefore, this must also be borne in mind while adopting stringent measures against corruption. The event saw Girda’s old friend and aide Bishawambhar Nath Sah, who is better known as Sakha. He spoke about him with a flow that was unprecedented. An expert on culture himself, Sakha called upon those associated with Girda and his works not to deitify him. “Don’t compress him in frames but make serious efforts to understand what he stood for and take his thought forward. Worshipping him will be a great injustice to him. We have to imbibe his thought and retain his spirit,” he said categorically. Another one of Girda’s old friends and accomplices Shamsher Bisht pointed out that it needed to be understood how Girda struck a balance within the existing socio-political framework of society. He underlined that like Girda, it is necessary to have clarity of political thought. Stating that the intellectuals should never shy from speaking out the truth, he said no barrier can stop the truth from reaching its destination. He also underlined the need to understand Girda’s political facet. “He never addressed anyone as comrade yet he was amongst the biggest comrades that Uttarkhand has ever seen,” said Bisht. The speakers advocated setting up of a chair in the universities after Girda and introducing his works in the academic curriculum at various levels. They also called for affordable representations of his works so that these works can reach out to the masses not only in Uttarakhand but other places as well. Director of Uttarakhand Bhasha Sansthan Savita Mohan promised to do everything to promote Girda’s thought. She claimed that several of the suggestions made were being implemented. Eminent historian and among the top brass of Pahaad, Shekhar Pathak gave a detailed over view of what the organisation was doing to promote Girda’s works. He announced that a digital archive of his works was being prepared and would soon be available for everyone on the net free of cost. According to the president of the party, PC Tewari, the yatra would be focusing on the Kumaon region during this phase. After a meeting of the party held in Nainital, he welcomed the decision of the Election Commission of not to allow political parties to set up kiosks with voter lists during the coming Assembly poll. “We welcome the step taken to curb election expenditure but want the ECI to come out with more such measures,” he said. Uttarakhand will become the first state where the election slips will be distributed by the Election Commission. Earlier, this activity was undertaken by political parties. Along with the election slip even kiosks set up by political parties will be banned for the elections. This had been announced by the Chief Election Commissioner, Dr SY Qureshi, during a visit to Dehradun some time ago. Tewari told The Tribune that the UPP was working towards providing a viable political alternative to the two main parties in the state, the Congress and the BJP. “We will emerge as a major force in the state and will provide an alternative before the people,” he said. He once again lashed out at the ruling BJP and the Congress for letting down the people of the state on all fronts and defying the purpose for which Uttarakhand had been created 11 years ago. “The very purpose of the Hoshiyar-Khabardar Yatra is to expose the two parties before the people of the state,” he said. The UPP is yet to come out with itslist of 40 contestants for the coming Assembly poll which was supposed to come out by this month. The party leadership has made it clear that the UPP would not do anything for short-term electoral gains and is in favour of a long-term political strategy based on the people-centric issues. The UPP has once again appealed to the people to come forward and teach a lesson to the BJP, the Congress and the UKD. The party leadership is trying to fill in the void left by the decline of the UKD and emerge as the third powerful regional alternative in the state. He alleged that the Centre had so far fooled people on the Lokpal Bill and it seemed that it was not interested in checking corruption. “For the past one year, the Central Government has been issuing false assurances on the issue. It seems to be least interested in checking the menace of corruption,” Sisodiya alleged. He further said Anna Hazare would himself visit all poll-bound states, including Uttarakhand, where he would be holding public meetings to expose the “role” of the UPA in bringing up a weak Lokpal Bill in the country. With regard to Anna’s Mumbai fast from December 27 to 29, Sisodiya said a large number of people from Uttarakhand would be taking part in the fast. 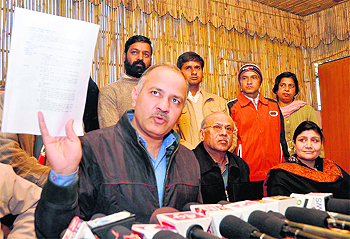 Later, Sisodiya held a meeting with Team Anna’s supporters in the state. He called upon them to take forward Anna’s fight against corruption. The Congress burnt an effigy of Prakash Pant, who is the local legislator, at the Siltham chowk today and raised slogans. They blamed the BJP workers for pushing the women protesters during at the college on Wednesday. “When the villagers had already announced that they would not let the minister inaugurate the building, then why had he gone with a large number of BJP workers there?” asked Prem Chandra Punera, a senior worker of the Congress, who organised the protest against the minister. The BJP workers, on the other hand, burnt an effigy of the Congress alleging that the protesters were hired by the Congress. “The Congress workers seem to be frustrated at the works done by the minister in the Bans area where not only a science faculty building has been opened but a new community health centre has also been inaugurated by the minister,” said Govind Singh Bora, district vice-president of the BJP. “The maximum number of polling booths have been added to the Dharchula Assembly constituency (14) and opened in the high-altitude areas of Garbiyang, Nabi, Duktu and Marcha. Twelve new booths have been added to the Pithoragarh Assembly constituency,” said District Election Officer R Rajesh Kumar. The DEO further said seven more polling booths had been opened in the Didihat constituency and five in the Gangolihat constituency. According to the election office, the highest number of polling booths is in the Gangolihat constituency, where 145 polling booths will be activated during the elections followed by the Dharchula constituency 131 booths, Pithoragarh 119 and Didihat 115 booths. The Garbyang polling booth will have voting facility for the villagers of Selase, Garbyang, Bundi and Napalchu. The Navi polling booth will facilitate the voters of Rongkong, Nabi, Gunji and Kuti villages. The polling booth at Duktu will be for the voters of Dugtu, Nagling and Baling village and the polling booth at Sela will have voting facility for Sela, Go, Khimling ,Charchum and Filam villagers. In the sixth minute Railways’ Harish converted deftly a penalty corner into goal. In the next nine minutes, Ravi Bharat again utilised another penalty corner while in the 23rd minute Shah Jahanpur’s captain Lal Kumar scored a field goal. Ten minutes later, Major Singh with a classic field goal put the Railways’ margin to 3-1 before the half time. The second half of the match saw two back-to- back goals in just a three minute span as Ravi Bharat (40th minutes) and Deepak (43rd minute) again showcased Railways’ dexterity in penalty corners. With a 5-1 lead, Shah Jahanpur players regrouped themselves and just three minutes later after suffering fifth goal, Deep Kumar scored via field goal and in the 56th minute, captain Lal scored another, making the score 5-4. Just a minute before the last whistle, the Railways once again succeeded in utilising the open defence as Harish earned himself a field goal, leaving Shah Jahanpur team players awestruck. In the second match of the day, Uttarakhand Police clean swept Muradabad -11 with a 5-0 tagline. Devnath, president of the PJSM, said thousands of Purvanchal people lived and worked in the state of Uttarakhand and faced many problems while travelling across the state. They demanded inclusion of cities of Purvanchal in the Gorakhpur Express, which leaves from Dehradun for Lucknow and vice-versa.